With only 20 months for design, permitting and construction, the replacement Poplar Bluff Regional Medical Center project in Missouri required a collaborative BIM approach to meet the owner's ambitious schedule. Due to Poplar Bluff's proximity to the New Madrid Fault, the project also required use of large buckling restrained braces (BRBs). Overall, nearly 2,400 tons of steel were used on the $112 million project, not including the BRBs. 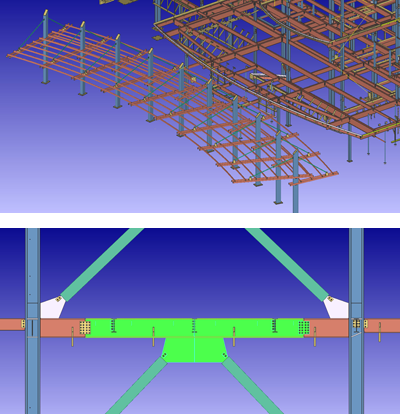 To help meet the schedule, SDS/2 customer Structural Detailing, LLC, out of Brentwood, Tennessee, teamed up with Star Seismic to write a parametric program to import the model of the brace gusset plates and braces into SDS/2. Structural Detailing, LLC was responsible for detailing the entire structure. To learn more about this project, check out the March issue of Modern Steel Construction.